We’ve got a new scoop on the HTC’s upcoming flagship device, the HTC U 11. We’ve already heard the device will come with a 3.5mm headphone jack to USB-C adapter, which directly implies that the device won’t feature a headphone jack. What, are you surprised? Anyway, a new leak comes to us today from reliable rumor leakster, Onleaks. 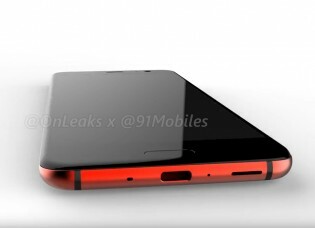 The HTC U 11 is featured in a rendered video with a bright red color scheme, which looks quite “hot”, just in time for the summer. 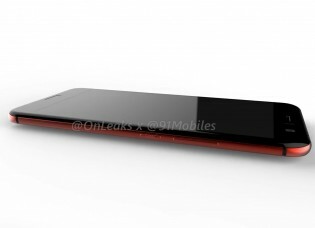 The backside is the just as glossy-red as the HTC U Ultra was glossy-blue. 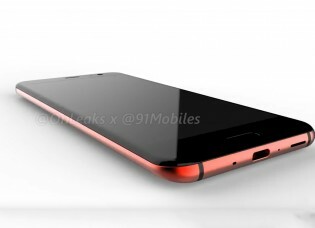 Anyway, if we are to believe this is the HTC U 11, then the renders should be spot-on, as they are based on CAD (Computer-assisted-design) drawings that leaked either from the factory or from a case maker. This is the first time we’re able to get a really good look at the device and the placement of the various buttons, sensors, and ports. Starting with the top we see a slotted mic-hole, across from that is a round pin-hole for ejecting the SIM/microSD card tray. On the bottom, we see the USB-C port, a long-slotted speaker grille, much like the Google Pixel’s, and two similar holes: one slotted and one pin-holed. One is the in-call mic, though we’re not sure what the other would be given its juxtaposition, perhaps another noise-cancelling mic? As a reminder, final hardware could vary. Moving on, the left edge has no buttons or trays, though will be touch sensitive to be able to use HTC’s squeezable gestures. Moving on again, the right side has the standard HTC layout of hardware keys, the power button sits just under a volume rocker. Bringing it over to the front, the fingerprint scanner lives just under the display. Notice how the display spills over the edges? Know that this isn’t a curved display, upon close inspection, we can tell that the display is flat (and supposedly 5.45-inches) and what we see spill over the edge is the bezel. This gives the illusion of a curved screen, something that some other manufacturers have been doing since Samsung started the curve trend. 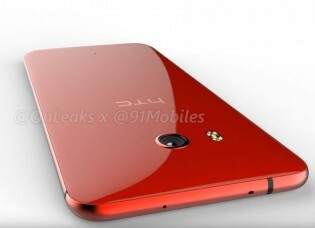 On the glossy red back, there’s a 12MP camera with a round camera ring; by contrast, the HTC Ultra has a square one with rounded corners. 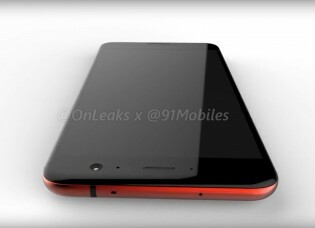 What we see missing though, is the laser-assist sensor window from the HTC 10, either HTC has scrapped it, or the render was based off older CAD drawings. The HTC U 11 is expected to use the latest Snapdragon 835 chip from Qualcomm and have 4GB/6GB of RAM. A 3,000 mAh battery is unchanged from the HTC 10, so we are hoping that consumption with be comparable with the SD835. Otherwise, a 12MP camera is on the back, with a 16MP selfie camera. After the release of the HTC U Ultra, many were critical of the use (or lack thereof) of space within the device. Let’s hope HTC kept the bezels to a decent size for 2017.